Clinically Dosed Formula: Shredded Steel takes a comprehensive and holistic approach to solving your fat loss dilemma by using a multi-pronged attack on unwanted body fat. 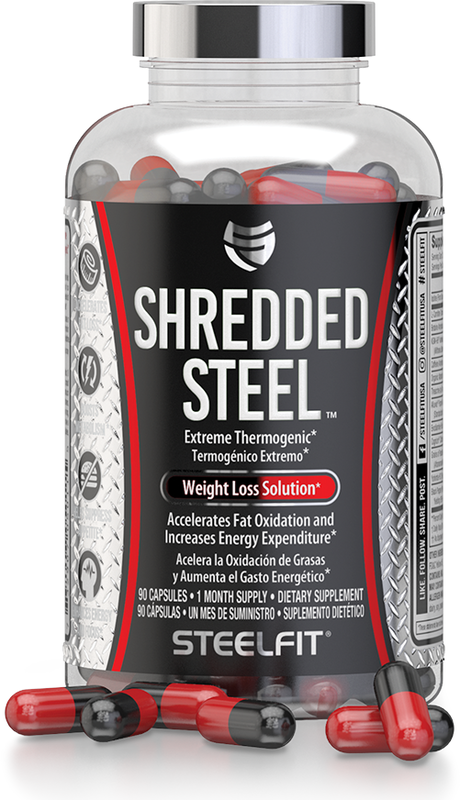 Included in Shredded Steel is an arsenal of premium quality ingredients that attacks weight loss from multiple fronts, including compounds that increase fat mobilization, enhance fat oxidation, and boost energy expenditure. Accelerates Fat Loss: Shredded Steel is a powerful fat burning, thermogenic weight loss supplement scientifically formulated to help you shed unwanted body fat. Enhances Energy and Focus: Unlike other fat burners, Shredded Steel doesn’t rely on a proprietary cocktail of stimulants that only make you think the product is working when in reality you’re left feeling jittery and on edge. 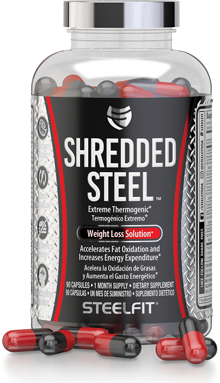 Instead, Shredded Steel uses a combination of caffeine and TeaCrine to provide smooth, sustained energy that lasts for hours all while avoiding the jitters and crash of other weight loss supplements.